As previously discussed in many articles, in the wild, sea turtles face many dangers including boating, fishing activities and fibropapillomas. 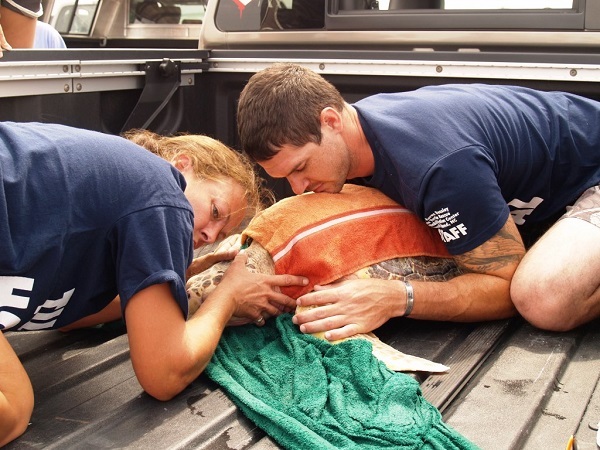 If a turtle suffers an injury at sea, who receives it for care and treatment? You guessed it – sea turtles often come right here to Topsail Beach in coastal North Carolina! This is where you’ll find the Karen Beasley Sea Turtle Rescue and Rehabilitation Center (KBSTRRC). Located in Topsail Beach, NC, KBSTRRC currently houses several different sea turtles including loggerheads, greens, and kemp’s ridleys. 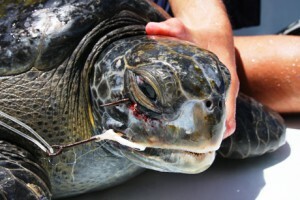 All turtles at the hospital suffered from some type of physical trauma, usually caused by humans. 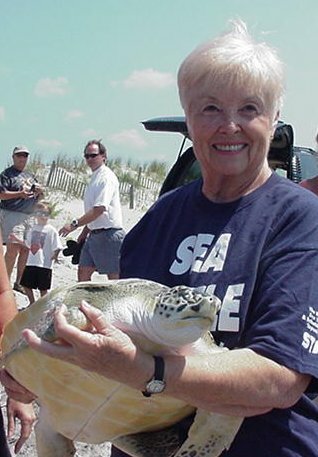 Karen Beasley first organized the Topsail Turtle Project when she saw the need to preserve and protect sea turtle nests, nesting females and hatchlings on the 26 miles of coastline on Topsail Island. After Karen’s untimely death, the torch was passed on to her mother, Jean Beasley (pictured right), who is the Executive Director of KBSTRRC today. In 1997, the rehabilitation center opened after tireless efforts of the Beasley family and the generous donations of money, time and material from local residents, businesses and visitors. After these many years of operation, the KBSTRRC has become a great success! 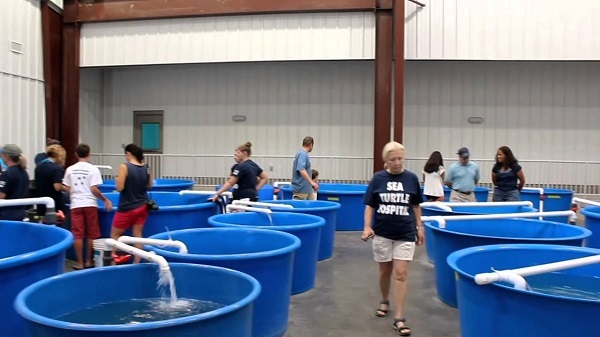 Over 100 rehabilitated sea turtles have been released back to the sea! Volunteers and donations serve as the sole driving forces for the organization. During the summer months, high school and college interns are recruited to help with the hospital, the beach project and summer tours. It takes many people each day to keep the center running smoothly. It is often difficult and hot work, not to mention dirty and smelly! However, the rewards are plentiful where you find them, especially the look in the turtles’ eyes when you are able to return them home to the sea. The facility is small, but mighty. The limited space is always an issue, but Jean manages to somehow fit in all the turtles that need help. The indoor facility features a flow through water exchange system that continuously pumps clean, heated water to the turtles’ tanks. If you remember, sea turtles are ectothermic, so during the winter months they are kept inside the hospital, but during the summer, tanks are moved outside so the turtles can heal in the sun! Walking a stretch of beach in the early morning to look for turtle crawls and new nests. Arriving at the hospital around 7:30 a.m. to begin medication and food (fish, squid, and crab) preparation. Feeding each turtle according to its needs and wants (they can be picky eaters!). Scooping each tank to remove any food particles/waste, then scoop, scoop, scoop some more! Massaging each turtle’s back to give them some TLC, and then cleaning each tank. Physically prepare the building for afternoon visitors. Open facility to the public and introduce the patients. Close to the public, clean up, scoop tanks, go home… rest, repeat!